Politics affects virtually all aspects of our cultural, economic, religious and social lives, and almost all public decisions are made through collective political activity. As social beings, humans lead inextricably interconnected lives. Political science looks at the complex connections we form with one another when we organize and govern ourselves for the good of humanity. As a political science student, you open your eyes to human interaction. By studying people, their decisions and the powers that influence them – money, culture, religion and law, among others – you equip yourself to participate in the creation of social, economic and political systems that promote justice and improve societies. At St. Norbert College, you can earn a Bachelor of Arts degree in political science. You may also pursue a minor in political-science teaching. You also will find that your St. Norbert College political science degree prepares you well for graduate studies. St. Norbert College political science alumni have attended law school or pursued graduate degrees that netted them roles in government and higher education. At St. Norbert College, you can debate current political topics and explore career options through Forum, a student political organization. You also might like to get involved in the College Democrats, the College Republicans, the Model United Nations, or other related student organizations. Since 1996, qualified St. Norbert students have participated in the for-credit U.N. Seminar in either New York City or Geneva, where you can examine the United Nations and its importance in global power relationships. Your academic excellence in political science may earn you entrance into three academic honor societies: Delta Epsilon Sigma, Pi Sigma Alpha or Pi Gamma Mu. St. Norbert College’s participation in American University’s Washington Semester offers you access to internships in politics, justice and environmental policy. Internships also are available through many regional employers and government offices, and through the college’s own Strategic Research Institute, a faculty-run social science research-services firm. One day, my advisor suggested I give the Washington Semester program some consideration. Maybe she wanted me to see what opportunities th emost powerful city in the world had. I applied for an internship with Sen. Ron Johnson before I left campus because I thought it would be cool to work for the senator of my home state. Shortly after sending my resume and having a phone interview, I got the internship. Steven Garza ’13, an international studies and political science double-major, had the privilege of working at the White House as an intern in the office of the Chief of Staff. During Garza’s time at St. Norbert, he undertook significant research in the area of Russian arms. 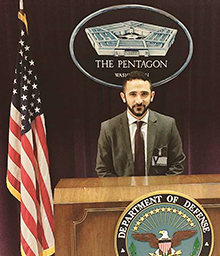 His research led him to interviews with former U.S. diplomats and weapons experts, “It was really a unique opportunity to combine scholarship with an application to the real world and it gave me insights you might not be able to find in books,” said Garza. 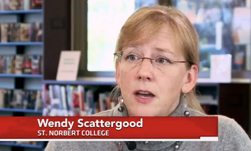 Wendy Scattergood (Political Science) shared with PBS NewsHour that even in a deeply divided electorate, the Wisconsin tradition of tough-minded independent voters is alive and well.